It looks like this website can have a stable future during the winter season as former HepsNation athletes are excelling on the Bobsled and Skeleton scene. Back on June 25th, the USA Bobsled and Skeleton federation honored a total of seven athletes – three of them HepsNation members – with their annual sporting awards. Jamie Gruebel Poser – 2014 Olympic Bronze medalist in the two-woman bobsled and former Heps champion for Cornell in the multi-events – was given the top honor of Bobsled Athlete of the Year. Poser (third from right) finished second overall in the World Cup circuit by earning six top 3 finishes in 8 World Cup events, which included two gold medals. She also finished fifth overall individually and sixth in the team event at the 2016 World Championships. 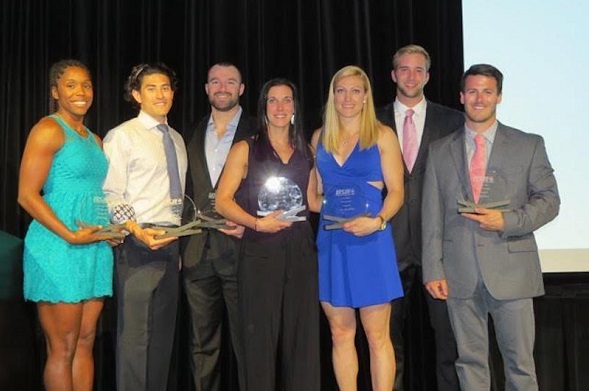 Other award winners were Annie O’Shea as the Skeleton Athlete of the Year, Terra Evans as the Women’s Bobsled Athlete’s Choice, Carlos Valdes as the Men’s Bobsled Athlete’s Choice, and Kyle Brown as the Skeleton Athlete’s Choice. This entry was posted on Friday, July 1st, 2016 at 10:00 am. It is filed under Alumni, Spotlight. You can follow any responses to this entry through the RSS 2.0 feed.